According to TechCrunch, the social networking company is experimenting with the AR feature in a closed beta tied to the forthcoming "Ready Player One" and "Wrinkle In Time" movies. As seen in the video below, the camera in Facebook's app is used to identify markers on a movie poster. These special glyphs trigger and anchor AR overlays like a giant animated robot, special screen effects and flowers that appear to emerge from 2D advertisements. Unlike Facebook's past attempts at AR integration, the marker-based system provides a real-world lattice onto which digitally generated graphics can be applied. Much like Snapchat and Instagram, the company has in the past dabbled in free space AR concepts like face filters and other solutions that rely on object detection. 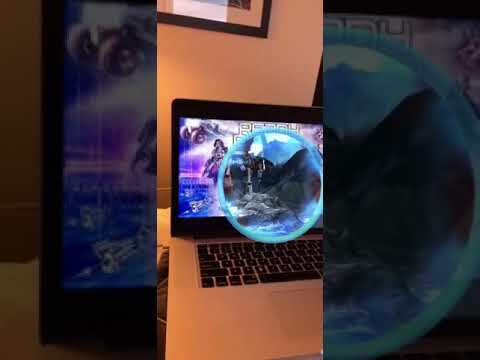 Facebook Camera product manager Matthew Simari acknowledged work on the tracker-based AR feature in a statement to the publication. "In the future, we believe AR will be in the world all around us. Rather than the ephemeral capture and share' sessions we see today, AR will sit in a hidden data layer that you access through your devices -- phones today, glasses tomorrow," Simari said. "Your phone is the magnifying glass that is allowing you to peer past your reality into a hidden experience locked (key word) to a place or object in the world around you. It's the transition from experiences being ephemeral to them being persistent. It is made more powerful by the fact that the AR now has immediate context because it is directly relevant to place or target where you are." Facebook will demonstrate the AR feature with posters advertising "Ready Player One" at SXSW this weekend, the report said. Future plans include incorporating the functionality into its AR Studio, a set of development tools for app makers. Apple, too, is working on expanded AR capabilities and recently launched ARKit 1.5. In announcing the updated framework, Apple touted the ability to create AR experiences from movie posters, though the technology relies on complex image recognition, not markers. Then facebook can use these 'glyphs' as a way to track the users. Smart, but no cookie here*. * I'm never going to use facebook. Facebook releasing something else to get more info and tracking data from you. After Apple and Samsung, it seems like Facebook is making its app more engaging and entertaining. Well, glad to know that Facebook is working on it. Will see how it will work. They should just make the app lighter and faster!